Vascular malformations occur more rarely in bones than in soft tissue, with 0.5–1.0% of all intraosseous tumors occurring in the mandible. We report a diagnostically challenging case of unilocular venous malformation of the mandible. A 76-year-old man presented with a heterogeneous, unilocular, radiolucent lesion with a well-defined border. Panoramic radiography and computed tomography imaging revealed a continuous white line on the cortical bone at the inferior border of the left mandibular molar region. A spherical lesion with a well-defined border and a clear round region in the left mandible were revealed on magnetic resonance imaging. The lesion had the same signal intensity as muscles on T1-weighted imaging, a homogeneous high-intensity signal on short T1-inversion recovery imaging, and a well-defined low-signal intensity region surrounded by a high-intensity signal region on T2-weighted imaging. Pathological findings indicated that the lesion was a venous malformation. Although many studies have reported that venous malformations have a multilocular appearance, few have described the occurrence of unilocular lesions. 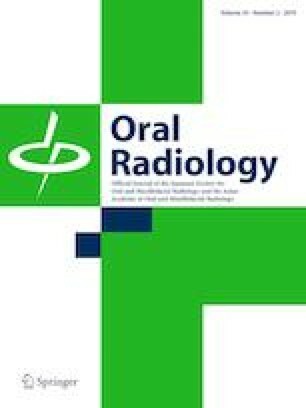 Future investigations using magnetic resonance imaging and computed tomography are needed to increase the diagnostic accuracy for unilocular central vascular malformations of the jaw bone. The authors thank Yumi Ito (Department of Diagnostic Pathology, Tsurumi University Dental Hospital), who offered valuable advice during the histopathological diagnosis. We obtained consent from the patient in this case report. This case report was approved by the Tsurumi University ethics committee (no. 1602). The patient described in this report provided informed consent for publication of anonymized case details. Shintaro Okura, Chinami Igarashi, Satsuki Wakae-Morita, Takashi Ichiko, Hirokazu Ito, Masashi Sugisaki, Toru Sato, and Kaoru Kobayashi declare that they have no conflict of interest. The Japanese Society of Interventional Radiology (JSIR). ISSVA classification of vascular anomalies 2013. http://www.jsir.or.jp/blog/2015/02/26/vascular/. Accessed 20 Aug 2016.